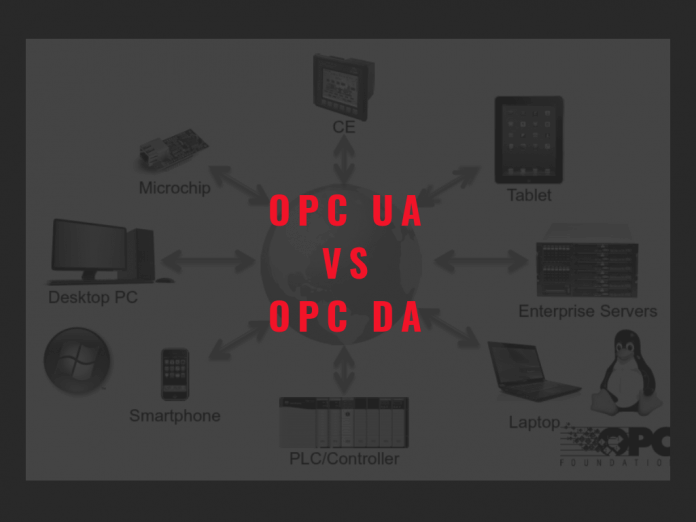 Thus OPC can be considered as language for the communication between machines in industries, in which one of the latest version of OPC that is OPC UA (Unified Architecture) is a cross-platform protocol for machine to machine communication like English and on the other hand the older version of OPC is OPC DA (Data Access) not compatible with multi-platform. 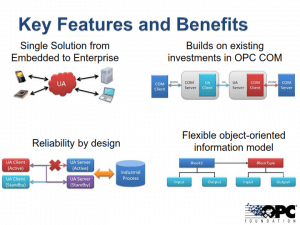 OPC stands for OLE (object linking and embedding) for process control and it is a client-server based communication. A Series of standards and specifications are developed for industrial telecommunication, which is commonly known as Open Platform Communications (OPC). It provides assurance regarding security and reliability while exchanging data in the industrial automation space and even in other industries. The communication between the control devices by a different manufacturer in real time is specified by OPC? 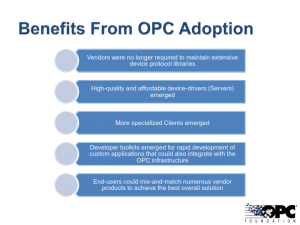 Initially, the requirement to form a common bridge for different window based software application and process hardware gave rise for designing OPC. The protocols that are included in classical OPC model are DA (Data Access), AE (Alarm and Events), HAD (Historical Data Access), XML DA (XML Data Access), AND DX (Data Exchange), and on the other hand, there is OPC UA (Unified Architecture). For Automation in industries, a protocol called OPC Unified Architecture (OPC UA) is developed by the OPC Foundation that was mainly focused on the communication between machines, i.e. machine to machine communication. It is a cross-platform protocol and that’s why it does not depend on any particular operating system or programming language. And the security provided by OPC UA is robust. The basic difference between OPC DA vs OPC UA is the version, in which the older version of OPC is DA, where it supports the older version of data modeling which is not as great as the data modeling provided by OPC UA. Also, the transfer of the information that takes place between the server and client in OPC DA is only VQT that stands for Value Quantity and Time. 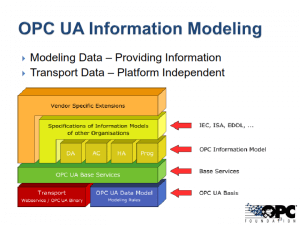 But on the other hand, OPC UA which is the new version of OPC provides data and information modeling as well as many properties that can be shared between the client and server about a variable. As OPC DA comes under OPC classic model, it supports DCOM communication for connecting the client and server, where DCOM is dependent on the operating system and supports only Window OS. 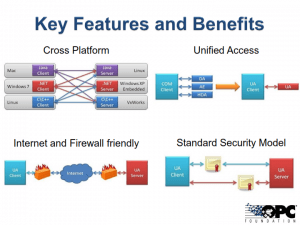 And on the other hand OPC UA do not rely on DCOM communication for connecting client and server, thus it is a platform or OS independent and it supports platform such as Linux (Java), Apple, or Windows. OPC DA allows to access only the current data and is incapable to generate alarms, historical events whereas OPC UA supports features like historical events, multiple hierarchies and provides methods and programs (that are called commands). One of the limitations of OPC DA is its inadequate security, as in today’s world security is the major issue because systems are more frequently attacked by some sophisticated viruses and malware and this security issue is solved in a higher version that is OPC UA. 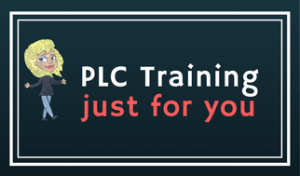 It is an OPC DA specification that defines how real-time data can be exchanged between a data source and a data sink (for example a PLC and an HMI) without either of them having to know each other’s native protocol. It is an OPC UA specification that states how real-time data is communicated between machine to machine for industrial automation. One of the applications of OPC DA is in factory automation for the communication from DCS and PLC to Management Information System. OPC DA specification resolves the problem of data conformity between different platforms and decreases the costs of software development and maintenance. As there is a change in the Industrial revolution the requirements of industry increases as per their increase in their needs and to adopt the new changes they choose to adopt the new ways or technologies. As per the revolution, Industrial 4.0 is the current trend for automation and manufacturing industries. It is nothing but a one step up, focussing in the field of cybersecurity, cloud computing and the industrial internet of things. This revolution brings a great challenge for the manufacturers which were using OPC DA or older versions in terms of security and slow communication speed with less innovation in their process. So it has been stated that there is no Industry 4.0 without OPC UA. The main challenge as per Industrial 4.0 and IIOT (Industrial Internet Of Things) is the secure, exchange of data its information between different devices, machines etc. across different industries which may or may not be located at the same place. As it is recommended by IEC standard, OPC UA is best-suited standard for communication in this revolution. 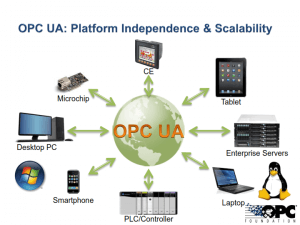 It has also been said that OPC UA is not just a protocol, it is a whole IoT into one.